VitalVit is a comprehensive family of seven products, featuring a specific combination of minerals and nutrients to balance your soil and plant chemistry. Quality and purity you can trust! Boron VitalVit B is an Organic fertilizer based on enzyme digested hydrolyzed proteins and boron to prevent or correct nutrient deficiencies that may limit crop growth, yield and/or quality. Suitable for use on all organic and conventionally produced plants. Details/compliance certificates. Calcium VitalVit Ca is an Organic fertilizer based on enzyme digested hydrolyzed proteins and calcium to prevent or correct nutrient deficiencies that may limit crop growth, yield and/or quality. Suitable for use on all organic and conventionally produced plants. Details/compliance certificates. Copper VitalVit Cu is an Organic fertilizer based on enzyme digested hydrolyzed proteins and copper to prevent or correct nutrient deficiencies that may limit crop growth, yield and/or quality. Suitable for use on all organic and conventionally produced plants. Details/compliance certificates. Iron VitalVit Fe is an Organic fertilizer based on enzyme digested hydrolyzed proteins and iron designed to prevent or correct nutrient deficiencies that may limit crop growth, yield and/or quality. Suitable for use on all organic and conventionally produced plants. Details/compliance certificates. VitalVit Mg 3.5-0-0 Magnesium VitalVit Mg is an Organic fertilizer based on enzyme digested hydrolyzed proteins and magnesium to prevent or correct nutrient deficiencies that may limit crop growth, yield and/or quality. Suitable for use on all organic and conventionally produced plants. Details/compliance certificates. 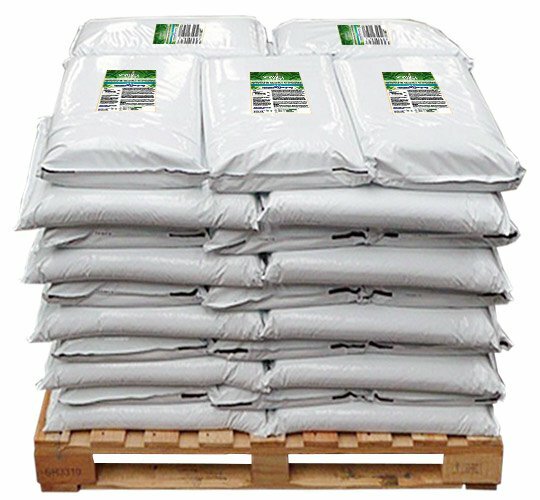 VitalVit Mn 5-0-0 Manganese VitalVit Mn is an Organic fertilizer based on enzyme digested hydrolyzed proteins and manganese to prevent or correct nutrient deficiencies that may limit crop growth, yield and/or quality. Suitable for use on all organic and conventionally produced plants. Details/compliance certificates. Zinc VitalVit Zn is an Organic fertilizer based on enzyme digested hydrolyzed proteins and zinc to prevent or correct nutrient deficiencies that may limit crop growth, yield and/or quality. Suitable for use on all organic and conventionally produced plants. Details/compliance certificates. 1225 lb Supersack (555.65 kg). How is Grower's Secret VitalVit applied? Grower's Secret VitalVit can be used as part of a comprehensive nutrient management program. It can be applied as a foliar spray, a root soak or through a drip application on all agricultural crops including trees, woody plants and turf. VitalVit is used to enhance chlorophyll content, root growth and flower set and development and helps improve crop quality. Will Grower’s Secret VitalVit damage or burn my crops? Grower's Secret VitalVit products should only be used according to plant needs and suggested use rates. If you have not used a product before, we recommend that you conduct a small jar compatibility test before mixing products to be applied at the same time in the field and also conducting a small infield phytotoxicity test before you apply it in wide-scale use. What is the shelf life of Grower's Secret VitalVit? What packaging sizes is Grower’s Secret VitalVit sold in? Grower's Secret VitalVit products are available in 50 lb. bags, 2200 lb pallets and 1,225 lb. super sacks. Can Grower's Secret VitalVit be used through drip systems? Grower's Secret VitalVit can be applied through a drip system at suggested use rates. Check system calibration and function to assure even distribution and proper application rates are being applied. What is the proper use rate for Grower's Secret VitalVit? Growers can apply 14-21 oz of VitalVit powder in a foliar application in sufficient water for coverage. Soil applications should be applied at a rate of 2-5 pounds per acre. All applications should be made according to plant needs as determined from plant and soil analysis. GS VitalVit benefits your crops safely.